In March of1989, after almost thirty years at the head of the NFL, Pete Rozelle unexpectedly retired two years before the end of his contract. After having turned the NFL into the number one American Sport, and the largest sports business in the world, Rozelle decided to retire while still in good health to spend more leisure time with his wife Carrie. Seven years later he would die of brain cancer at the age of 70. Vrentas, Jenny. 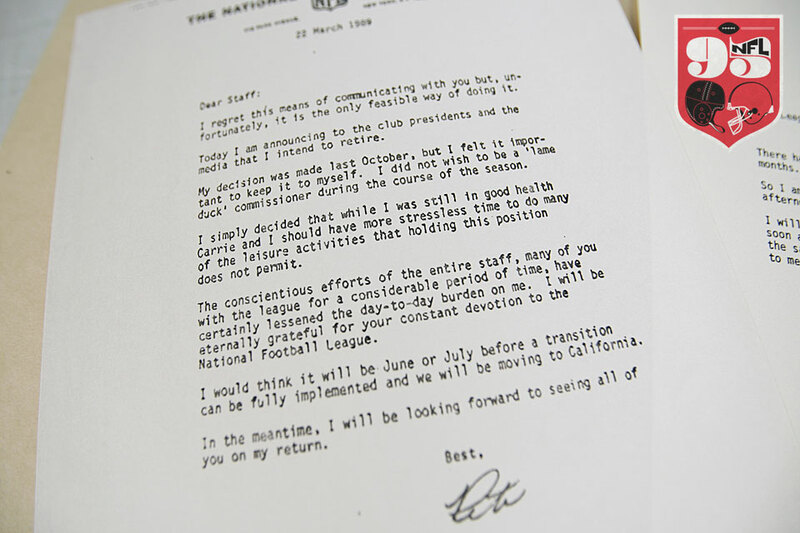 "Pete Rozelle's Retirement Memos." "A History of the NFL in 95 Objects." Sports Illustrated. 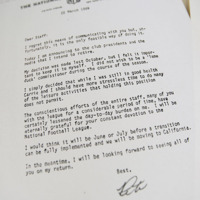 June 25th, 2014.http://mmqb.si.com/2014/06/25/nfl-history-in-95-objects-pete-rozelle-retirement-memos/, “Rozelle Retirement Memo,” The American Century, accessed April 20, 2019, https://americancentury.omeka.wlu.edu/items/show/148.